Having got some precious AVI video files, we find it depressing that we cannot play them on our new iPad 2. Want to convert AVI to iPad 2 for entertainment? Feel like watching your AVI shootings on iPad 2? Before we move on to how to decode AVI to iPad 2 on Mac, let's know more about iPad 2 compatible formats. Generally speaking, like iPad, Apple iPad 2 supports H.264, MPEG-4 in MP4, MOV, M4V video formats as well. So, we should change AVI video to iPad 2 compatible format first. 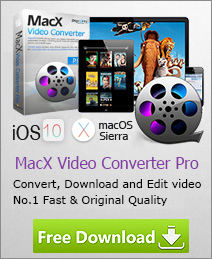 This article will show you how to reach this goal with MacX Video Converter Pro, which is perfectly compatible with iPad 2 and keeps a good balance between the speed and output quality: it can easily convert AVI to iPad 2 supported formats with the fastest speed (integrating hardware acceleration tech Quick Sync/Nvidia/AMD), and also with the original quality. The world's fastest iPad video converter to decode HD/SD AVI video to iPad 2 (iPad Pro/mini 4/Air 2 etc) on Mac with 5x faster speed than others while the original quality reserved! This AVI to iPad 2 converter for Mac allows users to enjoy AVI videos with the large and high-resolution screen freely. The following will introduce the step-by-step on how to transcode AVI to iPad 2 on macOS (Mojave incl.). After Free download MacX Video Converter Pro and fire it up; click "Add File" to load the AVI files. Select iPad format from the format list as the output format. What's more, the default optimized video settings make the output video looks great on your iPad 2. After finish the above steps, click the "RUN" button to start conversion, you could view the conversion progress and are able to cancel the process at anytime. Later, you can play AVI on iPad, iPhone, Apple TV and more. This iPad format changer can easily convert kinds of videos to iPad 2 for playing. The input format includes AVI, MP4, MKV, FLV, M2TS, H.264/AVC, RMVB, MPEG, etc. Moreover, MacX is specially designed for Apple users, it also can transcode video to iPad 2, iPad, iPod, iPhone, Apple TV with corresponding resolutions. 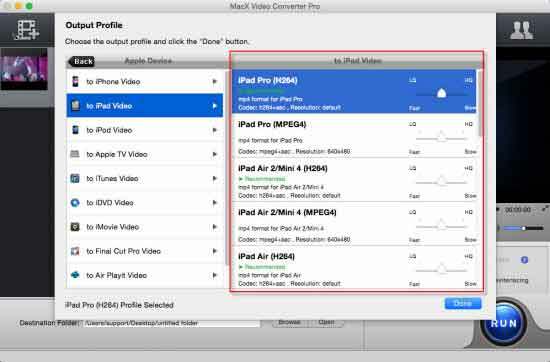 With ability to convert AVI to iPad 2 on Mac, a solid iPad video transfer tool, MacX MediaTrans, can help decode and transfer AVI video to iPad 2 on Mac needless of extra software or iTunes sync. Follow the guide below to start. Free download the Mac to iPad converter & transfer (macOS Mojave supported) and run it on Mac computer. This program introduced here supports to change AVI video files to iPad Pro/Air 2/Mini 4 running iOS 12/11, and all iPad generations. Step 1: Connect your iPad 2 to Mac with a USB cable and turn off iTunes auto sync. Step 2: Click "Video" icon on the main interface to start converting AVI video from Mac to iPad 2. Step 3: Click "Add Video" button to import AVI videos from Mac. If the AVI video is not compatible with iPad 2, it will give "Unsupported format" message, click "Convert" button to encode AVI video to iPad 2 supported format codec on Mac. Then press "Sync" button on the bottom to transfer videos to iPad 2 without iTunes.